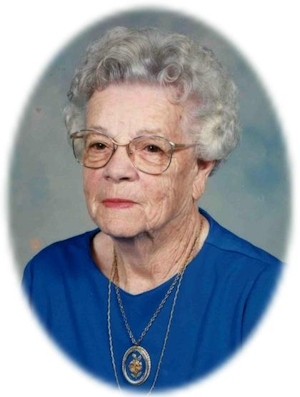 Obituary – Crispin, Hazel Florene (Campbell) « Perry High School Alumni Association, Inc.
Hazel Florene Campbell Crispin, 98, devoted wife and mother, was born December 13, 1909 in Mountain Park, Oklahoma to George W. Campbell and Lulu Yarrington Campbell. She died Friday, August 29, 2008 at the Green Valley Nursing Home in Perry, Oklahoma. She married Avery Crispin on November 11, 1933 in Stillwater, Oklahoma. He preceded her in death on December 1, 1994. She was a member of the Orlando Christian Church for more than 50 years where she served in many different roles. While living at the Green Valley Nursing Home she enjoyed her visits from family and friends. She especially enjoyed her Tuesday lunch visits from nieces, Sharon Harman and Mary Sue Roberts, great niece, Carrie Harman, her great-great niece, Briley Harman and her sister, Dorothy Golay. She loved to cook and bake and to have all her family over for dinner. She was a very good seamstress, but her favorite hobby was making quilts. She made quilts for herself as well as for many of her nieces and nephews. She will be greatly missed by her family. Funeral services will be 10:00 a.m. Wednesday, September 3, 2008 at the Orlando Christian Church. Rev. William Park will officiate. Interment will be in Morris Heights Cemetery. Services are under the direction of Brown-Dugger Funeral Home in Perry. Memorials may be made to the Orlando Christian Church in care of Brown-Dugger Funeral Home, 1010 N. 7th Street, Perry, Oklahoma 73077. Hazel is survived by two sisters, Dorothy Golay of Orlando, Oklahoma and Alta Wilson of Derby, Kansas; two grandsons, Eric Ingles and Mark Ingles; four nieces and their husbands, Sharon and Sam Harman of Orlando, Oklahoma, Carolyn and Mike Muth of Derby, Kansas, Mary Campbell of California and Mary Sue and Clyde Roberts of Perry, Oklahoma; seven nephews and their wives, Dennis Golay of Orlando, Oklahoma, Alvin and Suzanne Golay of Perry, Oklahoma, John and Kathy Golay of Orlando, Oklahoma, Ronny Golay of Perry, Oklahoma, Arthur Sonny and B.J. Johnson of Rush Springs, Oklahoma, Rocky and Diana Johnson of Perry, Oklahoma and George Wayne Campbell; seven great nieces, seven great nephews and 16 great-great nieces and nephews. She was preceded in death by her husband, Avery Crispin, one daughter, Evelyn Ingels, her parents, George and Lulu Campbell and three brothers, Ralph Campbell, Kenneth Campbell and Lester Campbell.